Lovebirds have fun personalities; they're well-socialized and devoted to their owners, as long as they get their owners' attention and interaction daily. In warm climates, lovebirds enjoy being outdoors. They prefer to bathe everyday and will bask in the warming sunlight to dry off from their baths. During cold weather, lovebirds need to live indoors. But in tropical climates, you can keep them outdoors year-round, with exceptions. If you spend time daily in your yard or garden, a single lovebird will benefit from a captive outdoor space. Keeping a single lovebird outdoors and alone without the regular presence of the owner or another lovebird to keep them company, will cause loneliness, depression and negative behavior, such as plucking out feathers. Single lovebirds can benefit from being outdoors if the owner's with them and contributing interaction, such as speaking or singing. If you can't be outside with the bird, you should keep a single lovebird indoors and near opportunity for social interaction and daily activity, and entertainment such as plenty of toys. Outdoor aviaries should be large, allowing an abundant amount of flight room for the lovebirds. The length should be 6 times the wing span of the lovebird, the width 2 to 3 times the wing span and the height 4 times the body length of one lovebird. Such an aviary will comfortably house two lovebirds. Plenty of toys, water, food and treats will keep the lovebirds busy. The aviary environment provides exercise spaceas the lovebirds hop, climb, play and fly freely within the aviary. Provide protection from intense outdoor weather. Lovebirds love light rain and rainwater. However, harsh pouring rain and thunderstorms are no good if they don't have a place to hide. An aviary needs protective barriers during harsh weather conditions. Predators such as rodents, raccoons, possums, cats and dogs may prey on lovebirds who live outside. Wild animals in the surrounding area will be attracted to lovebirds, therefore attracting wildlife to a pet owner's yard. 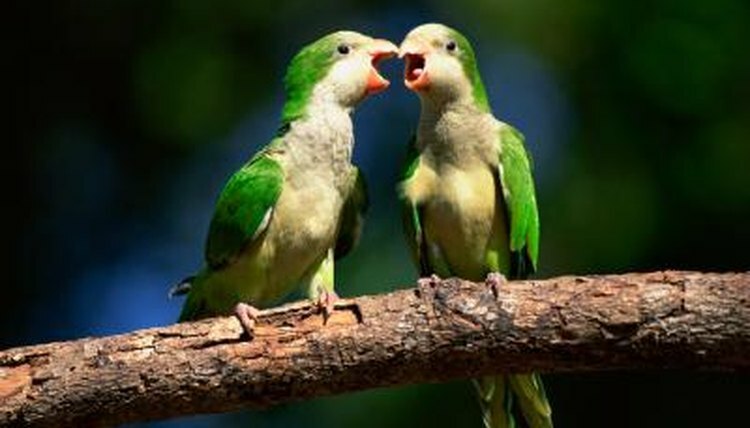 Lovebirds make a minimal amount of noise compared with other bird breeds, but they still make vocalizations when communicating with each other and may attract the attention of predators. Safe, secure surroundings when outdoors will protect lovebirds from being attacked by predators. Lovebirds do best when paired together, as they need constant companionship and socialization. Keeping paired lovebirds outdoors provides them with access to natural sunlight, fresh air and access to rainwater. Paired lovebirds can be housed outdoors on a permanent basis if weather conditions are ideal, safe and healthy and they are provided an aviary that is suited to their size and filled with plenty of toys, water and food.